Deep in the dusty bowels of this old newspaper building are files upon files of old recipes that ran years ago. It’s the kind of place where a fellow could get lost for hours. Like me. 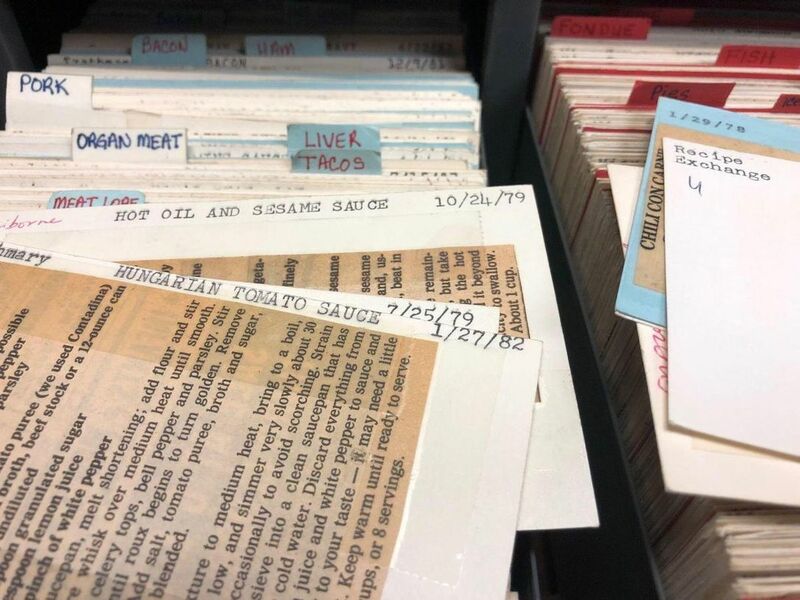 Thousands of recipes have been collected, cut out from the newspaper and carefully taped onto notecards, and then filed alphabetically according to a logic that is arcane and ultimately unknowable. I’ll admit to disappointment when I realized how relatively recent the files were. They end, as I had suspected, shortly after the newspaper library became fully digitized (they end in 1985). But as far as I can tell, they only go back to 1972. What we have, then, is an in-depth record of 13 years of American cooking. Times have not changed as much as you might think. Many of the ways we cook now are similar to what we were doing 40 years ago. On the other hand, cooks of 2019 would never think of doing some of the things we did a few decades ago, because times have really changed. Some of the foods we now find exotic were more everyday then, if these recipes are any indication. I don’t know of any home cooks who make turtle soup, but it was so popular then that among the many recipes for it is a way to make 40 gallons of the stuff. If you’re going to make that much, you’ll need a bushel of potatoes, 24 cans of pork-and-beans and five pounds of turtle meat. And no, I don’t know where you can buy turtle meat. Neither do I know why you would want to put pork-and-beans in perfectly good turtle soup. Cooks of the day were more likely to use corn syrup to sweeten their sauces than today’s cooks are, thank heaven, and also more likely to use questionable substitutes. I am thinking here of a 1976 recipe for Mock Pistachio Nuts. You simply dye chopped walnuts with green and yellow food colouring, and then toast them. I believe I am struck most by the enormous spectrum of taste and sophistication that the files reveal. Many of the dishes are on the order of Hot Dog Stroganoff, which is exactly what you think it is, or Chili Con Carne Con Licorice, which has pieces of licorice candy chopped into the chili. It may actually be decent, like chili made with fennel, but I don’t want to be the one who tries it. At the same time, the files are full of recipes for things like Octopus Pilaf and a Hot and Sour Soup that I seriously want to make. The Hot and Sour Soup recipe is included in a large and surprisingly expansive section devoted to foreign recipes. All of the expected cuisines have their own dedicated section of recipes — Greek, Indian, Japanese — but so do such unanticipated lands as Ceylon, Denmark and Indonesia (Nasi Goreng, Javanese-style fried rice). Crepes were so popular at that time that a large portion of the international recipes is given over to them, separate from the other French recipes, and grouped together by year. Some international recipes, though, were perhaps less international than others. Something called German Spaghetti, for instance, uses a stick and a half of butter or margarine and two tablespoons of bacon fat to sauté two pounds of ground beef and two pounds of mushrooms before adding four large cans of canned spaghetti with sauce. Eventually, it is all turned into a casserole. And you don’t want to know what they did with pizza, but I’m going to tell you anyway. Pizza Sandwich Loaf was hailed as “an attention-grabbing food idea for the teenagers in your house.” Pizza Pockets put pizza ingredients into a pita. And Pizza Sandwiches take a loaf of bread that has been sliced lengthwise and smears each half with a mixture of tomato sauce, pizza toppings and sliced American cheese. But perhaps my favourite recipe, of the ones I saw, is for an omelette. You mix together the eggs and then put them in a leftover Styrofoam takeout box from a fast-food restaurant, which you then microwave.